Welsh Stand Up TV Comedian Phil Evans - He's Brilliant! Hire A Comedian. Welsh Stand Up TV Comedian Phil Evans - He's Brilliant! Hire A Comedian! 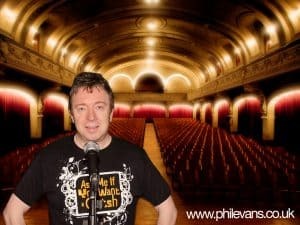 Phil Evans is a very funny chap, and one of Wales’ long established stand up comedians, with a proven track record in this most demanding of callings. A favourite with BBC, S4C and ITV for TV warm up work, Phil Evans is sure to delight all age groups. The ideal choice for hosting that special event, Phil will take control an make any event organiser look good. Blessed with a hint of Welsh charm, Phil’s accent is easily understood and brings the warmth of the Welsh to his stand up comedy performance. Phil is also ideal for corporate entertainment and events hosting, and is exceptionally busy flying all over the world (and a few other places) bringing his warmth and comedy to audiences everywhere. Why not book the ‘Phil Evans and Friends Show’? Fill out the form below or call him now! You won’t regret it.